"The dough is so soft, so supple, so sensual that it's a joy to make this bread. Pumpkin gives it a soft color and super-subtle flavor. It's a great country bread." Place pumpkin puree into a large mixing bowl and whisk in 1 cup plus 1 tablespoon warm water, salt, yeast, and pumpkin pie spice until thoroughly combined. Beat in flour to make a dry crumbly dough. Keep stirring until dough becomes smooth and sticky, 2 to 3 minutes. Cover bowl with a damp towel and let dough stand 12 to 16 hours to rise. Generously sprinkle cornmeal onto center area of a baking sheet. Scrape dough out of bowl, using a floured spatula, onto a heavily floured work surface. Dough will be very sticky. Dust dough with flour and gently flatten into an oblong shape. Fold 2 opposite rounded ends together to meet in the center; fold remaining 2 rounded ends to meet in the center, creating a rectangle of dough. Using well-floured hands, gently form into a round loaf with the seams on the bottom. Transfer dough round onto center of prepared baking sheet. Dust top and sides of loaf generously with more flour. Dust a dry towel with flour and place towel with floured side down over loaf. Let rise until loaf has almost doubled in size, 1 1/2 hours. 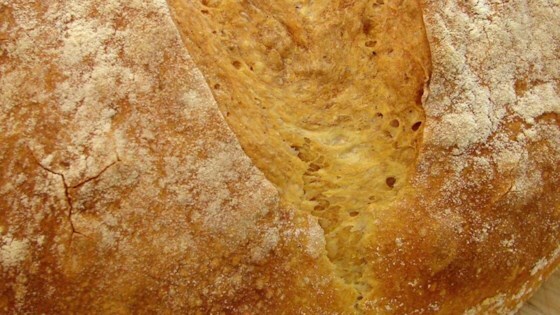 Use a sharp knife to cut a 1/2-inch deep slit across the top of the loaf. Place a loaf pan containing about 2 inches of water onto a bottom rack of oven. Preheat oven to 425 degrees F (220 degrees C). Bake on center rack of the preheated oven for 30 minutes; turn bread around in oven. Continue to bake until bread is golden brown and crusty, about 20 more minutes. Let bread cool completely on a rack before slicing. To make plain bread, substitute water for pumpkin and omit pumpkin pie spice. Bread is tough on the outside and sticky on the inside. Will never make again. This is a fantastic bread. I used 2-1/2 cups white flour and 1/2 cup oat bran and it was simply delicious!!! Just had my first piece and its amazing..... reminds me of good old German bread. its well worth the time and effort! Delicious, rustic bread reci pe. The pumpkin puree adds to wonderful heartiness of the bread. Lovely crust and chewy inside. This was so very easy to make and it was delicious. I doubled the pumpkin and it had a slight pumpkin flavor. It's a very good bread, but has little flavor of pumpkin. It will go great with all the Fall soups!